Perhaps it was fate that a German born musician and heavy metal bassist would move to United States a decade ago and then in 2019 find himself in Nashville at the same time when ACCEPT found itself saying goodbye to their longtime bassist. It was the right place and the right time for Martin Motnik. ACCEPT is pleased to welcome Martin and introduce him to all of you. Perhaps it was fate that a German born musician and heavy metal bassist would move to United States a decade ago and then in 2019 find a home in Nashville at the same time when ACCEPT found itself saying goodbye to their longtime bassist. It was the right place and the right time for Martin Motnik. Born in Ludwigshafen, Germany Martin began playing acoustic guitar early at age 7 and was introduced to the bass when he was just 12 by his brother, Frank (now a sound engineer in Frankfurt, Germany), who was also a guitar player. By the late 80s through 90s – Martin was playing bass in several rock and metal bands, both original and covers. Martin recalls he even played “Balls To The Wall” in a cover band in Ludwigshafen during that time. Martin released his solo CD “Bass Invader” with prolific studio drummer Gregg Bissonette, feat. Mattias IA Eklundh (signed with Steve Vai’s label “Favored Nations”) on guitar; favorable reviews in magazines in Europe, U.S., and Japan. Following two years of solo performances and bass clinics at Musikmesse Frankfurt, Musikhaus Thomann, European Bassday, Music Shop Munich, it was time to try out a new city, travel to explore Los Angeles with just a suitcase and his bass guitar. There he jammed with ECOTNIC featuring Jason Ebs (guitarist for Peter Criss) and Chris Slade (drummer for AC/DC), also jammed at legendary jazz club, The Baked Potato. Shortly after arriving in Los Angeles in the summer 2008, Martin got the call to join Uli Jon Roth (The Scorpions) for his US tour. 2009 and 2012 included two more North American tours with Uli Jon Roth. From 2014 to 2018 Martin was a bass player, band leader, and music director for Carnival Cruise Lines traveling to Australia, South Pacific (Fiji, Tahiti, Bora Bora), Hawaii, Alaska, Mexico, and the Bahamas. In February 2019 Martin made his way to Nashville to work as freelance studio and live bass player. 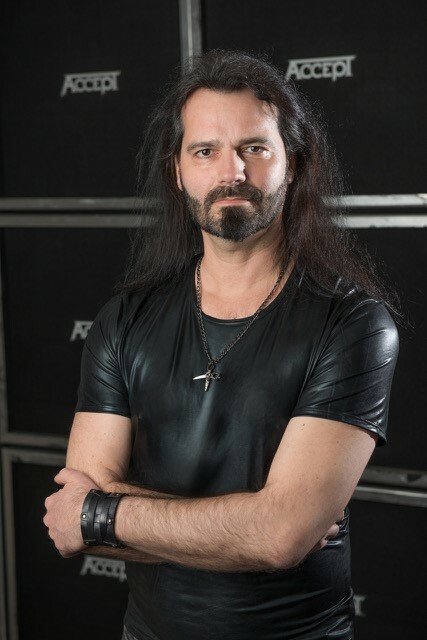 April 2019 – Martin Motnik joins ACCEPT with his first performance with the band on April 20, 2019. • Worlds Apart – Everlasting love (single) – ©1996 Arista/BMG, BMG Eurodisc Ltd.